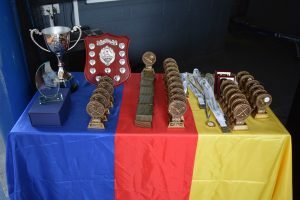 Our annual Awards Ceremony took place on Thursday 17th May 2017 where over 120 students received an award/certificate in recognition of their successes and achievements across a wide range of activities. 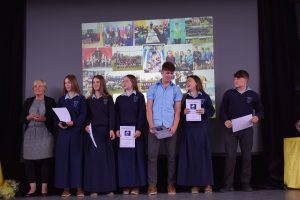 At the end of each year, St. Anne’s Community College hosts an end of year Awards Ceremony to acknowledge and reward the achievements of individual students and teams of the college over the year. This is a very special event in our school calendar and we are delighted to showcase and celebrate the successes of all our students. We recognise academic achievements as well as personal successes, positive contribution to school life and extra-curricular activities. School Principal, Aideen Walsh opened the proceedings and paid tribute to the students, their parents and their teachers for their work, commitment and support throughout the year. 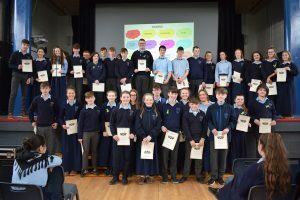 Students received awards for: Art, Debating, Enterprise, Film, Maths, School Mentors, Music, Musical Performance, Science, Speech and Drama, Student Council and School spirit and contribution to positive school life. Students involved in the Gaisce programme will receive their medals at their graduation night next week. In St. Anne’s we are lucky to have so many determined, driven and motivated young people who are achieving great things in different fields. 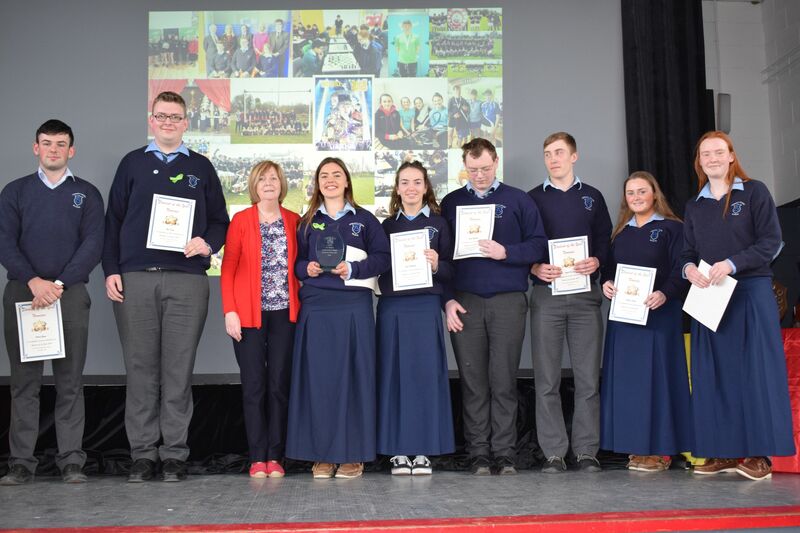 We acknowledged these students this year including: Siofra Thornton All Ireland winning Harpist. Maeve Óg O Leary and Roisin Houlihan U18 Munster Rugby Team, Finn McGeever Irish Swimming Team, Joseph McEvoy Irish Athletics, Jude McInerney Irish Climbing team, Callum Monaghan Irish World Dance Championships, Ellen Lane, Maeve Óg O Leary, Bríd McMahon and Eithne Walsh Irish U19 Fastpitch Softball Team and Daniel O Meara Irish Badminton Team. We are so proud of them all and their determination to keep striving to reach their goals and dreams. Sport is very significant in the life of the school and there is a strong tradition of success. 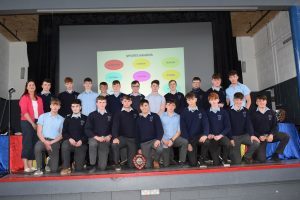 This year we had great success in a number of different sports including: Athletics, Badminton, Camogie, Gaelic Football, Hurling, Rugby, Rowing and Soccer are amongst the sports provided. 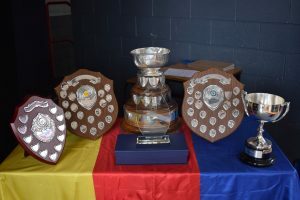 There was a huge amount of success in rugby this year with the Boys U19 team winning the O Brien Cup for the first time and the U18 boys team following their success to win the Bowen Shield B. We also had great success in badminton this year bringing home two golds and a silver medal from the All Ireland. The U19A team came 2nd in a very competitive top division final, with the U19B and the U16 teams winning gold medals. There was also success for the girl’s rugby teams who reached the Munster finals in both the 7’s competition and the 11 a side tournament. 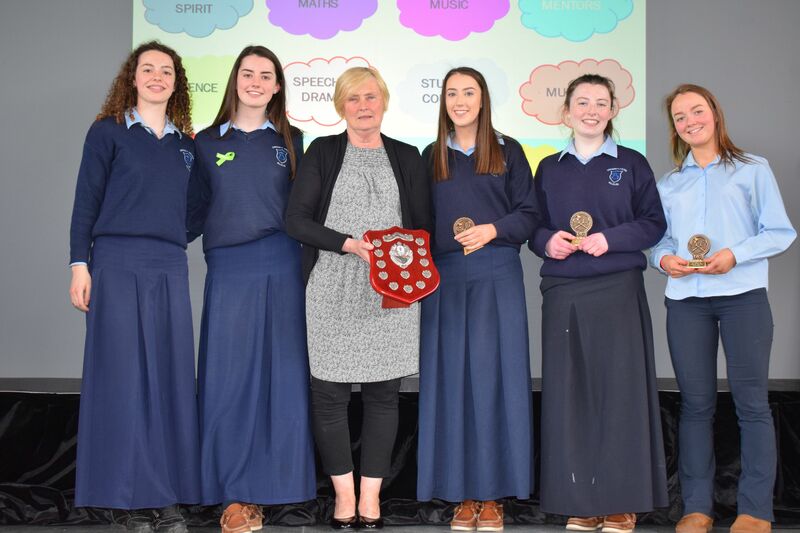 The Senior Camogie team also had success this year reaching the final of the Munster school’s competition only to be beaten in the final by a single point. 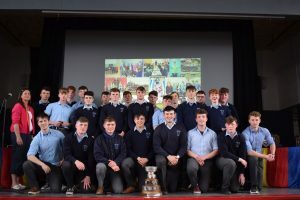 It is our hope, from all the sports department in the school, that the students leaving us in Leaving Cert will continue their sports both socially and competitively in the future and no doubt they will do us proud representing their county, Provence and Country in years to come. 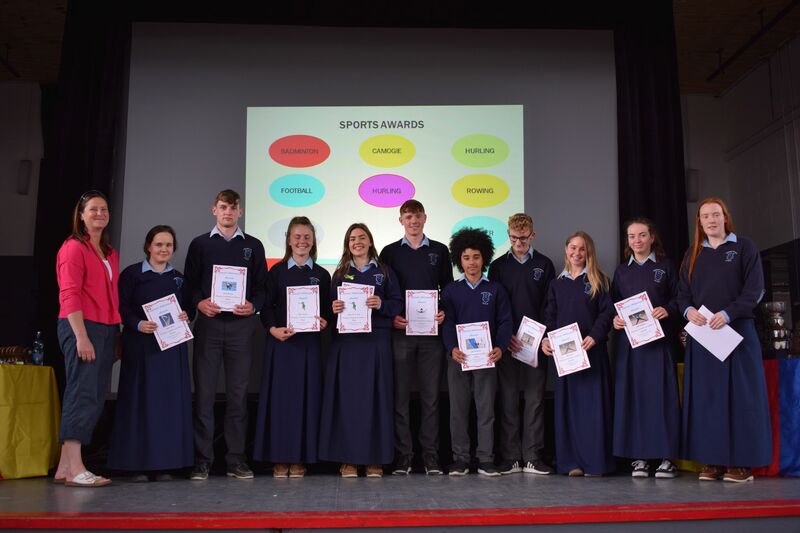 There were 6 nominations for the Sports Star of the Year this year including: Lynda Daly, Susan Daly, Rachael Daly, Dylan McMahon, Maeve Óg O Leary and Sam Loughran representing a number of different sports and achievements. 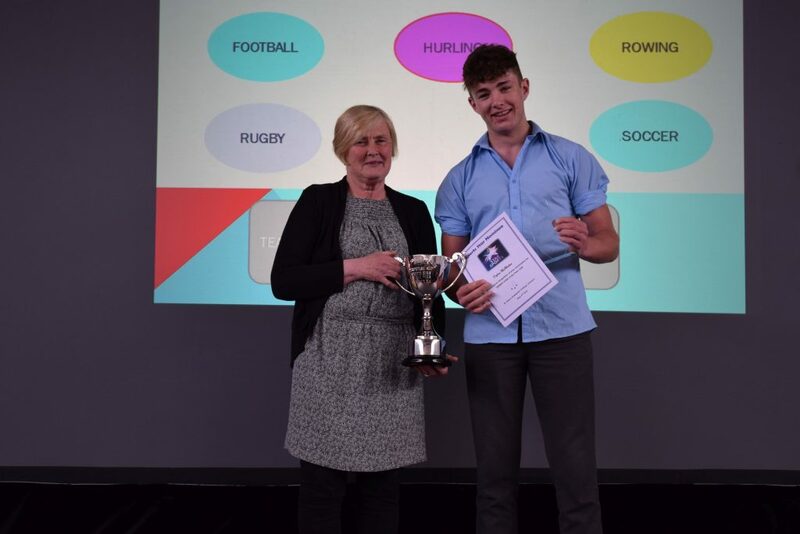 This year’s Sport Star is Dylan McMahon who received the Sarah Devane Perpetual Trophy. Dylan is a gifted sportsman who plays hurling, football and rugby for his school. He also plays hurling with his club and is presently a member of Clare County Minor team. Although not playing football or rugby with clubs, Dylan has shown his talent by being an integral part of both these teams. The Under 19B Badminton Team were the undoubted winners of Team of the Year. They have played together since 1st Year and although all in Leaving Cert have attended training during the week and at weekends. This year they won the U19B All Ireland finals in Gormanstown. The team include: Aoife Power, Rosaleen Ryan, Anna Ryan, Moya Marsh McMahon and Katie Moloney. Each year an outgoing Leaving Certificate student is acknowledged for the positive impact they make on life at St. Anne’s. 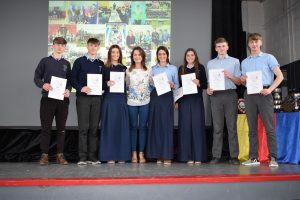 Ms. Walsh announced the nominees who were Eithne Walsh, Bríd McMahon, Maeve Óg O Leary, Harry Byrne, Ben Fitzgerald Kiely, Evan Rowlands, Hugh Denning and Ashling Conlan. This winner is Maeve Óg O Leary. To qualify for this honour, she showed herself to have qualities which are considered important to life in St. Anne’s; exemplary behaviour, diligent worker, good rapport with staff and peers, active member of school life, proud ambassador of school, pleasant and co-operative. 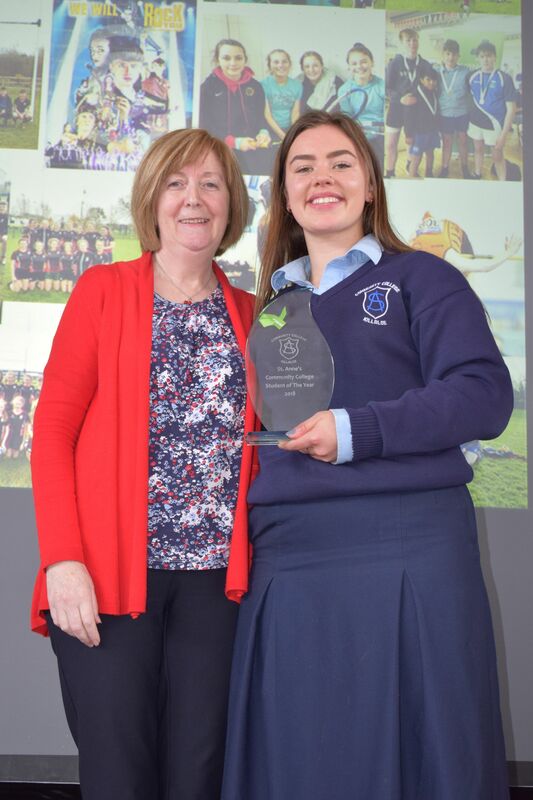 Up against tight competition from the 7 other nominations who were all selected by staff, Maeve Óg was the worthy winner for being a great role model for her fellow students always representing herself, her school and her family with pride. 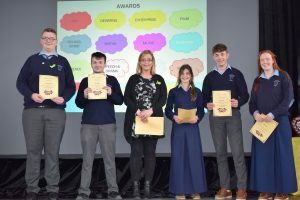 Ms. Walsh concluded the ceremony by congratulating all the award recipients for their individual achievements and thanked the teachers involved in organising the smooth running of the event. For more pictures of the ceremony, see the Gallery above or click here. By killaloeteacher in Other on May 18, 2018 .